The light-residential scenic region, Weta Rim, remains a personal favourite of mine. Perhaps this is because it marked the easternmost edge of the Irukandji Continent, and being a Queenslander, I'm used to sunrise over the ocean. Whatever the reason, it was magical. 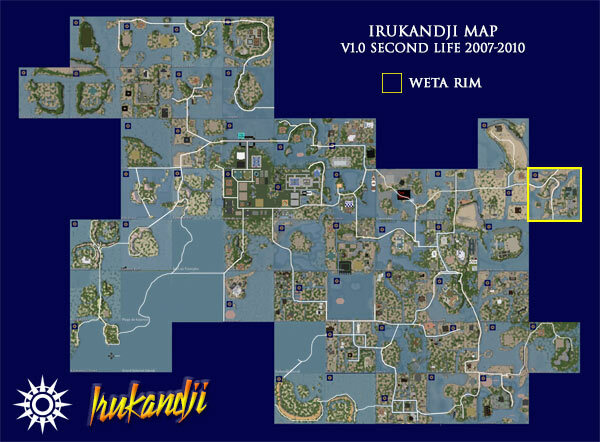 Located in Weta State in northeast Irukandji, Weta Rim was originally intended to be a scenic resort-style playground for the neighbouring residential state capital, Weta Island, however its popularity from across the kingdom demonstrated that it could be more. I subdivided four parcels on the southern beach, and three on the eastern cliffs which enjoyed uninterrupted sea views. All the parcels were purchased quickly by US residents. One particular mansion on the cliffs was a masterpiece. The owner spent a great deal of money on it, commissioning a master builder to construct a one-off build that worked in with the island's landscape rather than terraforming bits out of the way. Only three regions adjoined Weta Rim; Horn of Weta in the northeast, Weta Island to the west, and Upper Aboyo Passage to the southwest. Given its unique location on the edge of the kingdom, Weta Rim marked the easternmost end of the Trans Irukandji Causeway. 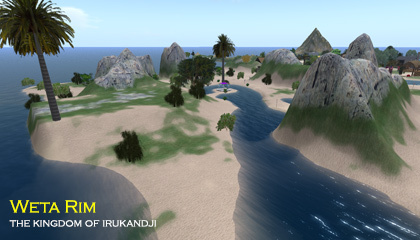 Below you will find a few extra photographs of Weta Rim. 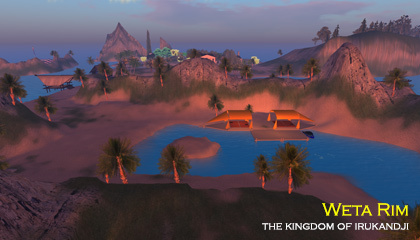 Historically, Weta Rim was the playground of the Weta royal family. In 1975, when Irukandji gained its independence and thus became a kingdom, the tribal elder, Daniel of Weta was elected by his peers to hold the crown. He served as king for four years then died unexpectedly of a weakened heart. Under the laws of succession, his eldest child would take the throne, but a coup took place by the Pinjarran warlord, Kebo, who sent assassins to the royal sanctuary on Weta Rim to murder Daniel's heirs. All of the royal children were killed, here on Weta Rim, and this event led to The Tamita-Pinjarra War.